He was in hurry to make the family of four! 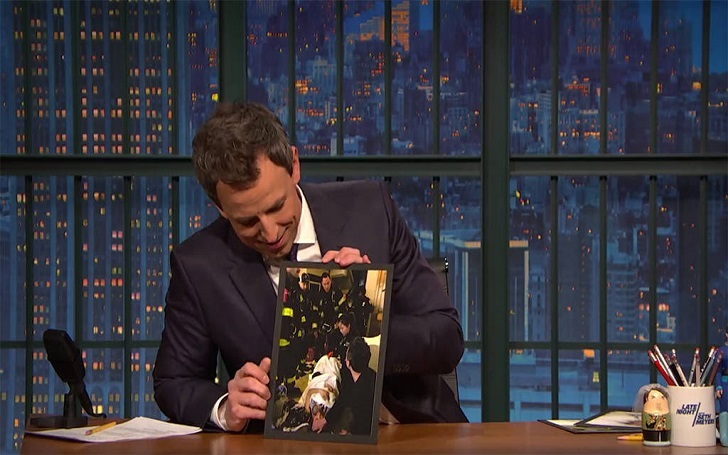 Seth Meyers and wife Alexi Ashe have welcomed their second child, a baby boy together on Sunday, April 8, and their son happened to be born in the lobby of their apartment. The 44-year-old late-night host revealed this good news on his show, Night with Seth Meyers, on Monday, April 9. The New York Police Department and fire department arrived at the couple's apartment just after their son, whom they have named Axel Strahl, born. They helped the couple cut the umbilical chord and neighbors put towels in the dryer to keep the newborn warm. The Seth and the human rights lawyer, who got married in September 2013 at Martha’s Vineyard in Massachusetts, are already parents of a 2-year-old son, Ashe Olsen Meyers. As previously reported, during the Thanksgiving episode of his show on November 23, Seth, alongside his parents, Larry Meyers and Hilary Meyers, and his brother Josh Meyers, announced that his wife was pregnant and they were expecting the couple's second child together. Your life completely changes, but it changes so much less than the mother’s life changes. Mine’s pretty similar except there’s a baby at home in the morning and at night, but I still go to work. I haven’t been great as far as being an assistant to my wife, in that the baby will wake up a couple times in the middle of the night and then I’ve been adding a third wake-up because I have night terrors about where the baby is. So I’ve been waking up, grabbing my wife’s face, saying, ‘I don’t know where the baby is.’ Then I just go back to sleep.